The SB800 Air Bike is the perfect way to boost your calorie burn. The 25" steel resistance fan is powered by you and allows you to train like an athlete at your own pace; the harder you push, the higher the resistance. You can set your own training goals with customized programs such as Target Distance, Target Calories, Target Time, or choose Manual Mode. The Champion program tests your training intensity and compares the values to previous sessions. For a pure calorie-burn workout, let SOLE SB800 assist you in achieving your goals. Purchase of the SOLE Fitness SB800 air cycle includes premium threshold delivery meaning your cycle is delivered directly to the first dry area of your home: inside your front door, garage, or inside the front lobby of your building, and will not be left on your curb. 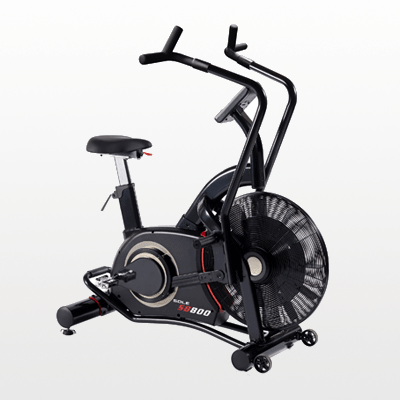 Built with a sturdy steel frame, the SB800 Air Bike is durable enough for both Light Commercial use and high intensity training. With large stationary foot pegs for resting your legs while still working your arms and an oversized cushioned seat that easily adjusts to accomodate users of all heights. Item Weight (lbs. ): 161 lbs. User Weight Capacity (lbs. ): 300 lbs. Shipping Weight (lbs. ): 178 lbs. Click here to view the user manual. At SOLE, we have designed our exercise cycles to meet consumer needs and allow you to work out on your own terms. The natural, comfortable feel of SOLE cycles has been created with an ergonomic design, adjustable seating, a large easy to view console display, and a strong durable frame. 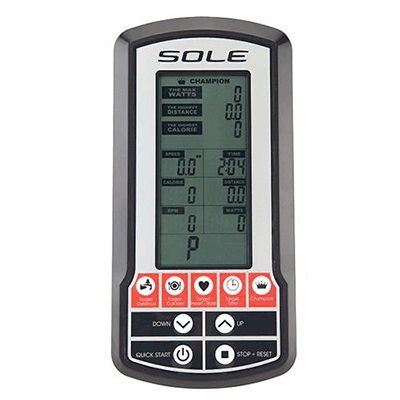 Using only premium components, SOLE has focused on ergonomic design without sacrificing quality. The SOLE air bike dual pedal system features large, articulating pedals to work ouot legs using the bike's air resistance, as well as large, stationary foot pedals for resting your legs while still working your arms. SOLE cycles feature adjustable seating to ensure all users are able to customize the seat position to their specific requirements, ensuring all users are in the correct position to maximize each workout. 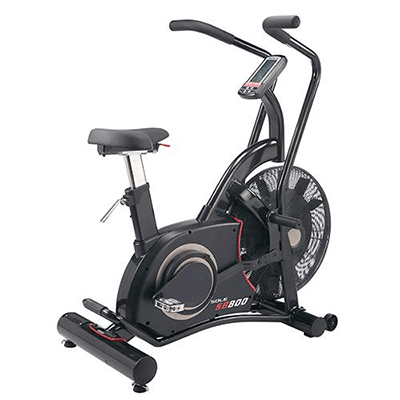 The Air Bike features moving handlebars for upper body training. They can be used simultaneously with the large foot pedals or used alone while resting your feet on the conveniently positioned foot pegs. You take control of the intensity of your workout by how hard you push. Easy console viewing helps to prevent frustration during your workout. With your workout feedback and progress displayed on a large screen, it is easier to keep your workout goals in view. A strong, durable frame is the foundation of SOLE Fitness cycles. Heavy steel tubing makes our indoor cycles durable, light, and manageable. Dual transport wheels at the front of each frame help make moving the cycles easy and convenient. The SB800 frame is built with high tensile steel with an industrial powder coated finish. A The 25" resistance fan provides easily controlled, varying levels of challenge for all workouts. The fan housing is left open so a constant breeze helps keep you cool during training sessions. Secure shopping with SOLE Fitness Canada.